The Chinese have a lot of symbols for good luck, making money, living a long life, health success and aversion to evil ghosts or spirits. 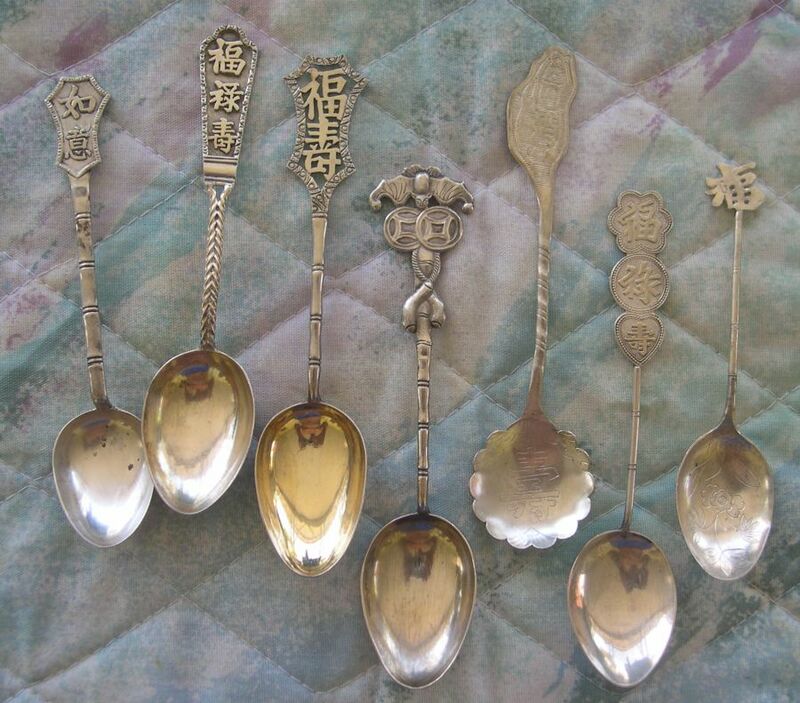 Most of these spoons are inexpensive souvenirs of tourist visits to Hong Kong, Taiwan (Formosa), Singapore or other Chinese cities. 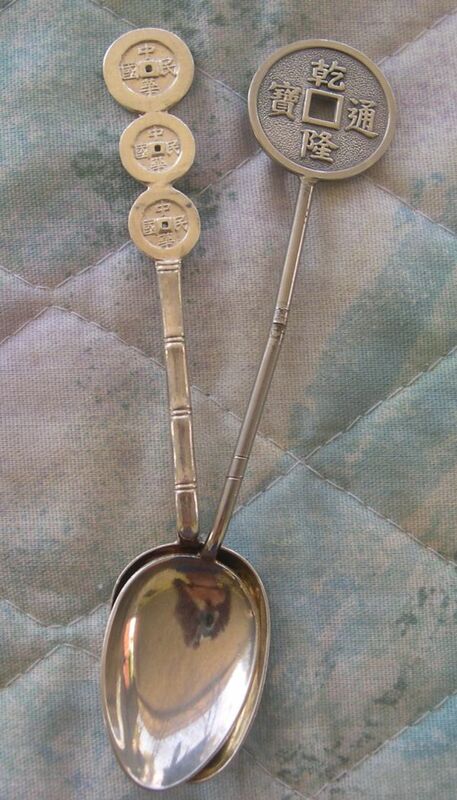 These are very nicely made spoons with an unusual shaped bowl. 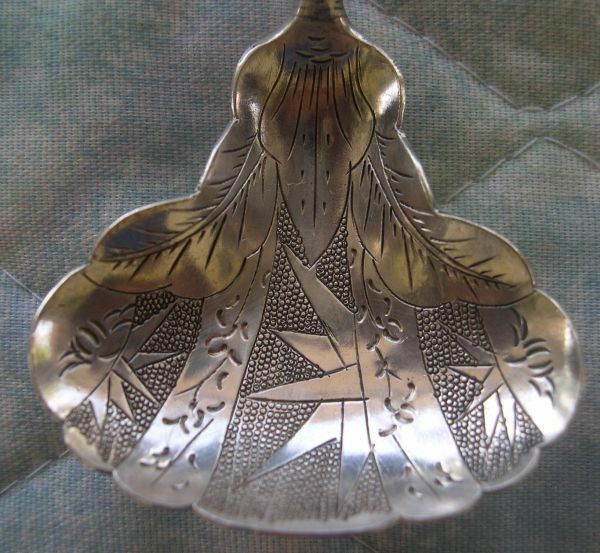 The basic spoon is the same, but the the handworkmanship is different. These spoons are marked "free China" with no purity mark. I am pretty sure they are close to sterling grade silver. The term "free China" is used in several different contexts, but in this case I am assuming they are talking about the Republic of Taiwan sometime after WW11. Most of the old Chinese coins have four characters. It is possible to date and determine coin value. The coins on these spoons are simulated. They were made for tourists. The inscriptions are usually for good fortune, success in business etc. 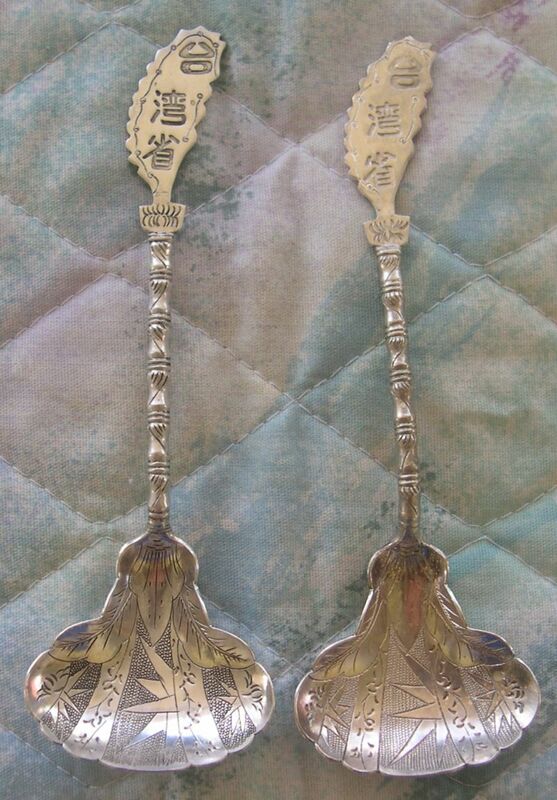 A variety of good luck, good fortune, long life spoons. Bamboo stems are very popular design motifs. The stork was believed to live for a thousand years and was often paired with pine trees which are also a symbol of longevity. I am not familiar with Chinese characters so if anyone wishes to add comments, please contact me. Another peculiarity of some of the Chinese dialects is that there are a very large number of written characters, but fewer spoken sounds. Therefore homonyms are often used as puns.